Officials at the signing ceremony in Doha. 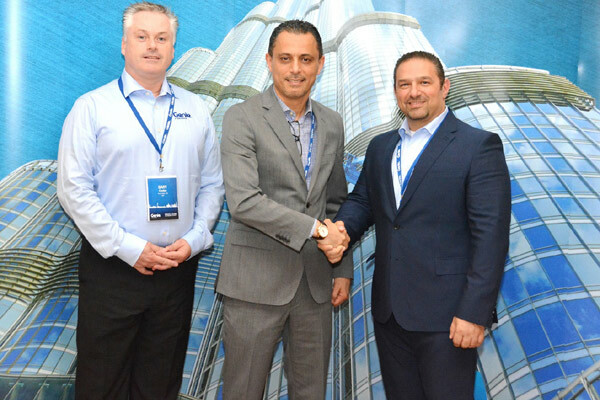 Terex Corporation, a global manufacturer of lifting and material processing products, has appointed Arabian Supply Center (ASC), an affiliate of the Qatari Al Jaber Group, as its new distributor for Genie boom lifts, scissor lifts and telehandlers in Doha. The appointment comes at a time when the demand for Genie products across the Middle East is soaring, said the statement from Terex. Within a short span of eight years, ASC has emerged as the leading supplier of construction and industrial equipment, spare parts, lubricants, tyres and batteries in Qatar. Based on the company motto “Quality You Can Trust”, the company constantly strives to deliver the best quality products and after-sales services to combine excellent value with an enhanced customer experience said the statement. “We had been looking for a reliable, customer-focused sales and service partner in Qatar for some time,” remarked Gary Cooke, Genie regional sales manager, Terex AWP for the Middle East at Terex Equipment Middle East. “Trusted by customers as a provider of high quality solutions, ASC has a very good reputation in the market and definitely ticks all the right boxes in terms of representing the Genie brand. The team is highly invested in its relationship with Genie and took part in The Big 5 trade show in Qatar last September. In addition to being a great platform to showcase Genie products, that event was a great opportunity to strengthen our relationship together,” he added. Darwish Ariqat, the commercial manager at ASC, said: "The strength of ASC lies not just in the products that we offer, but also in our strong after-sales network in Qatar. We aim for the best of the best and the brands we endorse reflect our company’s image."